The Laguna Woman gets her first date and flies to Paris! The artist George Stromer had worked previously with an anthropologist from Oceanside California, Dr, J.J. Markey, who was directing the Indian projects centered around San Louis Rey mission area. Mr. Stromer thought that Dr. Markey might be interested in seeing the skull and asked Howard if he could take it to him to see what he thought, as Dr. Markey's area of specialization was Southern California coastal Indians. Howard of course said yes, as he was still curious of anything he might learn about the skull he had found as a boy, 20 years ago. Dr. Markey's first impression on seeing the skull was how much it reminded him of ancient aboriginal skulls from Australia he had studied, and asked Howard's permission to study the skull further. Using a new and somewhat imprecise technology then called a "Wall Screen Counter" - the forerunner of today's precise Carbon 14 dating method - Dr. Markey was shocked when the results indicated a possible date of more then 25,000 years old! This was exciting news! The earliest known specimen of man up till then was only 9,000 years old, yet here was a individual that was possibly 2 1/2 times older then that! 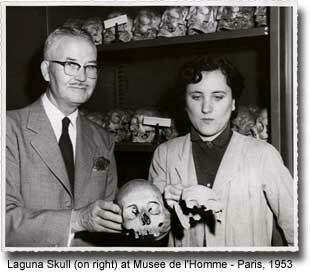 Great excitement erupted in American archeological circles, and Dr. Markey quickly made plans to take the skull to the "Musee de l'Homme", The Museum of Man, in Paris France. The greatest collection of prehistoric archeological skulls in the world, over 20,000, were housed there for study, and Dr. Markey wanted to have the Laguna Skull compared with them. Immediately, the scientists in Paris noticed that tiny mollusk shell fossils and other fossils of small plants still stuck to the skull were of a type that had become extinct over 100,000 years ago, thus raising hopes that the skull might be of the same age. They also agreed that the skull looked astonishingly like the same cranial segments of certain primitive tribes of Bushmen, who still live in Australia. Markey stated that "The similarities are sufficiently striking to justify the conclusion that the present day native Australians and the Southern California a common forefather" and that he must have crossed the land bridge between Asia and North America from 25,000 to possibly 400,000 years ago. But still, there was no way yet to say with absolute proof just how old the skull was, and that was where the subject lay. Until science invented a positive dating system, everything was just a guess. The skull then traveled throughout Europe, to museums in Madrid, Belgium, Holland, and eventually the British Museum in London. After eight long years of scientific study, the skull finally came home to Laguna in 1961 and back in it's old box on the shelf in Howard Wilson's closet. There it stayed for many years... Till once again, in 1967, incredible fortune came along and changed history forever. Dr. Louis Leakey, the world famous Archeologist was about to meet the Laguna Woman!